Avery Robert Dulles, S.J. (/ˈdʌləs/; August 24, 1918 – December 12, 2008) was a Jesuit priest, theologian, and cardinal of the Catholic Church. Dulles served on the faculty of Woodstock College from 1960 to 1974, of The Catholic University of America from 1974 to 1988, and as the Laurence J. McGinley Professor of Religion and Society at Fordham University from 1988 to 2008. He was an internationally known author and lecturer. Dulles was born in Auburn, New York, the son of John Foster Dulles, the future U.S. Secretary of State (for whom Washington Dulles International Airport is named), and Janet Pomeroy Dulles. His uncle was Director of Central Intelligence Allen Welsh Dulles. Both his great-grandfather John W. Foster and great-uncle Robert Lansing also served as U.S. Secretary of State. His paternal grandfather, Allen Macy Dulles, was a member of the faculty of Auburn Theological Seminary and published in the field of ecclesiology, to which the Catholic Dulles would likewise devote scholarly attention. He received his primary school education in New York City at the St. Bernard's School and attended secondary schools in Switzerland and The Choate School (now Choate Rosemary Hall) in Wallingford, Connecticut. He then enrolled at Harvard College in 1936. Dulles was raised a Presbyterian but had become an agnostic by the time he was a student at Harvard. His religious doubts were diminished during a personally profound moment when he stepped out into a rainy day and saw a tree beginning to flower along the Charles River; after that moment he never again "doubted the existence of an all-good and omnipotent God." He noted how his theism turned toward conversion to Catholicism: "The more I examined, the more I was impressed with the consistency and sublimity of Catholic doctrine." He converted to Catholicism in the fall of 1940. After both winning the Phi Beta Kappa Essay Prize and graduating from Harvard in 1940, Dulles spent a year and a half at Harvard Law School, during which time he founded the "St. Benedict Center". (The Center later became well-known due to the controversial Jesuit priest, Leonard Feeney, S.J.) He served in the United States Navy during World War II, attaining the rank of Lieutenant. For his liaison work with the French Navy, Dulles was awarded the French Croix de guerre. Upon his discharge from the Navy in 1946, Avery Dulles entered the Society of Jesus, and was ordained to the priesthood in 1956. After a year in Germany, he studied ecclesiology under the American Jesuit Francis A. Sullivan at the Gregorian University in Rome, and was awarded the Doctorate of Sacred Theology in 1960. Dulles served on the faculty of Woodstock College from 1960 to 1974, and that of The Catholic University of America from 1974 to 1988. He was a visiting professor at The Gregorian University (Rome), Weston School of Theology, Union Theological Seminary (New York), Princeton Theological Seminary, Virginia Theological Seminary, Lutheran Theological Seminary at Gettysburg, Boston College, Campion Hall, Oxford, the University of Notre Dame, the Catholic University at Leuven, Yale University, and St. Joseph's Seminary, Dunwoodie. He was the author of over 700 articles on theological topics, as well as twenty-two books. In 1994, he was a signer of the document Evangelicals and Catholics Together. Past President of both the Catholic Theological Society of America and the American Theological Society, and Professor Emeritus at The Catholic University of America, Dulles served on the International Theological Commission and as a member of the United States Lutheran/Roman Catholic Dialogue. Dulles was critical of dual-covenant theology, especially as understood in the U.S. Conference of Catholic Bishops' document Reflections on Covenant and Mission. He was a consultant to the Committee on Doctrine of the National Conference of Catholic Bishops. 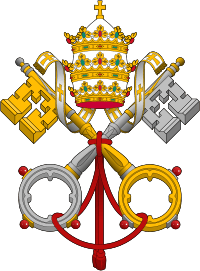 Although Jesuits make a promise against pursuing ecclesiastical dignities and do not normally accept promotion within the Church hierarchy, Dulles was created a cardinal of the Catholic Church in Rome on February 21, 2001 by Pope John Paul II. At the time of his elevation to cardinal, he was not raised to the rank of bishop, as is normally the case, as he had successfully petitioned the pope for a dispensation from episcopal consecration due to his advanced age. 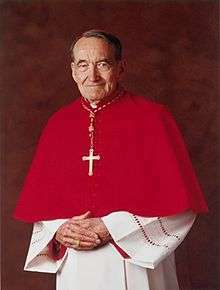 His titular assignment was as Cardinal-Deacon of SS. Nome di Gesù e Maria in Via Lata (the Most Holy Names of Jesus and Mary). 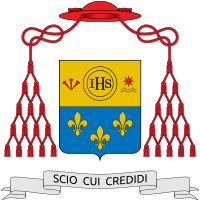 Because he had reached the age of 80 before becoming cardinal, Dulles had exceeded the mandatory age limit of retirement; he was never eligible to vote in a conclave (of which one occurred during his cardinalate, that of the 2005). Because he was a cardinal but not a bishop, Dulles became an honorary, non-voting member of the United States Conference of Catholic Bishops. Dulles' awards included Phi Beta Kappa, the Croix de Guerre, the Cardinal Spellman Award for distinguished achievement in theology, the Boston College Presidential Bicentennial Award, the Christus Magister Medal from the University of Portland (Oregon), the Religious Education Forum Award from the National Catholic Educational Association, America magazine's Campion Award, the F. Sadlier Dinger Award for contributions to the catechetical ministry of the Church, the James Cardinal Gibbons Award from The Catholic University of America, the John Carroll Society Medal, the Jerome Award from the Roman Catholic Library Association of America, Fordham Founders Award, Gaudium Award from the Breukelein Institute, and thirty-three honorary doctorates. In his later years, the cardinal suffered from the effects of polio from his youth. On Tuesday April 1, 2008, Cardinal Dulles gave his Farewell Address as Laurence J. McGinley Professor of Religion and Society. As Dulles was unable to speak, former President of Fordham University Father Joseph O'Hare, S.J., read his address. In addition to the loss of speech, the use of his arms was impaired but his mind remained clear and he continued to work and communicate using his computer keyboard. Current Fordham President Father Joseph McShane, S.J. also presented him with the University's President's Medal that evening. April 1, 2008 also marked the date the Cardinal's book, Church and Society: The Laurence J. McGinley Lectures, 1988–2007 (Fordham University Press, 2008) was released. Suffering and diminishment are not the greatest of evils but are normal ingredients in life, especially in old age. They are to be expected as elements of a full human existence. Well into my 90th year I have been able to work productively. As I become increasingly paralyzed and unable to speak, I can identify with the many paralytics and mute persons in the Gospels, grateful for the loving and skillful care I receive and for the hope of everlasting life in Christ. If the Lord now calls me to a period of weakness, I know well that his power can be made perfect in infirmity. "Blessed be the name of the Lord!" On April 19, 2008, Pope Benedict XVI gave the ailing Cardinal Dulles a private audience during his apostolic trip to the United States. Dulles prepared his written remarks to the pope prior to the visit. Dulles died on December 12, 2008 at Fordham University in the Bronx, where he had lived for many years. His remains were buried in the Jesuit cemetery in Auriesville, New York. Princeps Concordiae: Pico della Mirandola and the Scholastic Tradition – The Harvard Phi Beta Kappa Prize Essay for 1940, Cambridge, MA: Harvard (1941). A Testimonial To Grace Sheed & Ward, New York (1952); the fiftieth anniversary edition of this book was republished in 1996 by the original publishers, with an afterword containing his reflections on the past fifty years. The New World of Faith. Our Sunday Visitor Publishing. 2000. ISBN 978-0-87973-692-7. Newman. Continuum International Publishing Group. 2002. ISBN 978-0-8264-6287-9. ↑ As I Remember Fordham: Selections from the Sesquicentennial Oral History Project. [New York, N.Y.]: Office of the Sesquicentennial, Fordham University. 1991. p. 61. ISBN 0-8232-1338-2. ↑ Avery Dulles (1941), Princeps Concordiae: Pico della Mirandola and the Scholastic Tradition – The Harvard Phi Beta Kappa Prize Essay for 1940, Cambridge, MA: Harvard. ↑ McFadden, Robert D. (December 12, 2008). "Cardinal Avery Dulles, Theologian, Is Dead at 90". New York Times. Retrieved December 12, 2008. Initial text based on faculty bio posted with permission from Avery Dulles, S.J.